This year’s HVAC-R Expo Saudi has transformed Riyadh into a hub for the HVAC sector in the Middle East by bringing together several influential local, regional, and international suppliers and manufacturers to support the National Transformation Program 2020 and Vision 2030. According to the HVACR Expo’s report, the projected annual compound growth rate will peak at 13.11% by 2020, while the share of the Saudi market is projected to be 2% of the entire global market share. More than 85 suppliers of heating, ventilation, air-conditioning, and refrigeration products participated in the fourth edition of the exhibition, which took place recently. Moreover, the event hosted industry leaders from 14 countries - Saudi Arabia, UAE, Turkey, China, Italy, USA, Kuwait, Malaysia, Singapore, Egypt, France, Belgium, South Korea, and the UK - to showcase the industry's most innovative solutions. The HVAC Expo 2019 came with the support of Riyadh Chamber, the Saudi Council of Engineers, the Saudi Standards, Metrology and Quality Organization, and the GCC Standardization Organization. The expected number of visitors attending the exhibition was more than 6,500 visitors. 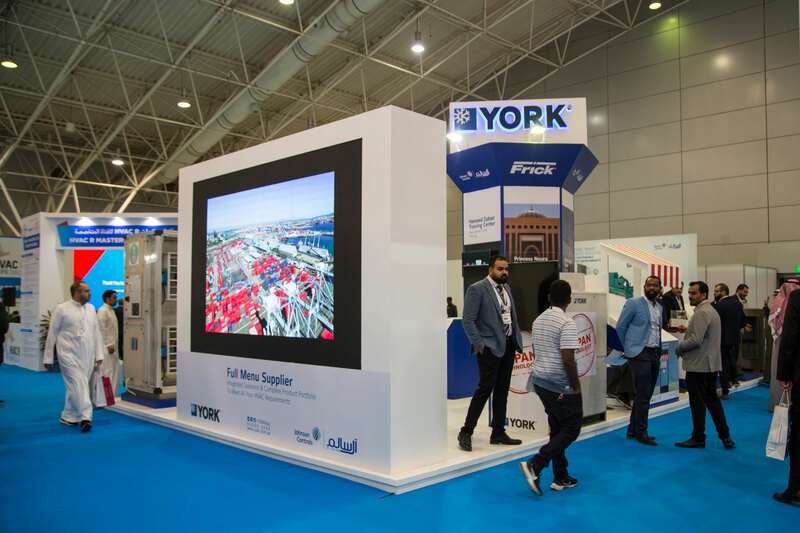 Al Salem Johnson Controls (YORK) showcased its latest innovations offered to the local market, which contributed to projects’ electricity, water consumption and operational cost savings. Among the innovative solutions that were showcased during the Exhibition: YORK’s Magnetic Bearing Chiller and its distinctive technical features; SABROE Industrial Refrigeration Chillers; in addition to YORK's, Japanese made, Variable Refrigerant Flow Systems (VRF) that meet the highest energy efficiency ratings. Additionally, the company exhibited Chiller Plant Controls Solutions and the Building Management System (BMS). In line with the trends of localization of manufacturing, the company offered several of its "Saudi-made" products, manufactured at YORK’s factory in Jeddah. For example, the Multi-fan Air Handling Units and the Fan Coil units, which are considered to be the optimum solution to ensure indoor air quality and purity in different facilities, especially in the healthcare, hospitals and hospitality sectors. As well as the commercial packaged units. The company also demonstrated the after-sales services, introducing visitors to the services offered by the largest specialist aftermarket service team in the Middle East, such as diverse customized service & maintenance contracts, rental solutions, and other services provided by highly qualified engineers and technicians. The CEO of Al Salem Johnson Controls (YORK), Dr. Mohanad Al Shaikh highlighted the importance of the company’s participation in the Expo, given the energy sector’s recent development and the need for sustainable solutions to keep pace in line with Vision 2030, and the objective to diversify the economy and localization of manufacturing. He also discussed the importance of supporting the localization of manufacturing, pointing out the company’s efforts to transfer the latest HVAC technologies for local manufacturing, maintaining the specifications, quality and standards set by YORK International. It is worth mentioning that the locally manufactured products are not only distributed in the Saudi market, but a wide range of the products are being exported to the GCC, Asian, and African markets. Al Shaikh further pointed that such exhibitions are an opportunity to introduce the latest HVAC solutions and systems, which will contribute to reducing energy consumption, while increasing cooling and operational efficiency. "Al Salem Johnson Controls (YORK) is keen to play a leading role in achieving the Kingdom's vision of a sustainable economy and diversification of its resources, and is seeking to harness its vast expertise in creating intelligent solutions for heating, ventilation, air conditioning and refrigeration." He explained that there are four main elements in terms of products and technologies that give the company competitive advantage: firstly, environmentally friendly in terms of cooling refrigerants and emission reduction; secondly, efficient in terms of water and energy savings: thirdly, sustainability; and fourthly, high operational efficiency. Al Salem Johnson Controls (YORK) participated in three free educational workshops at the HVACR Expo Saudi to support the needs of customers and professionals in the industry and highlight the capabilities, technologies and sustainable solutions the company has provided to its customers. The first workshop, conducted by Engineer Arif Hussain, the National Product Manager, discussed “Magnetic Bearing Technology in Centrifugal Chillers: Improving Efficiency”. The second workshop discussed the topic “Why is indoor air quality critical” (Airside Technologies) and was conducted by Rabie Makki, the Airside Product Manager. The third workshop, "Smart IoT Data Enabled Solutions," was conducted by the Building Efficiency Regional Business Development Manager at Al Salem Johnson Controls (YORK), Omar Al-Wakil. He spoke about the solutions for smart and sustainable buildings and the characteristics and advantages of this technology to help reduce energy consumption and improve operational efficiency in buildings. Moreover, he highlighted equipment, devices, and components that will be smarter and more powerful in the future, with their own diagnostic capabilities to predict, analyze, and automatically detect problems, as well as their large and extensive impact on corporate and domestic consumers, through the use of customer data environment (refrigeration equipment, building systems, and external sources).